Join Australian Army Trek leader, Joe Bonington, to experience the hardship and emotions as you pass through memorials, dugouts and bomb sites in the Papua New Guinean jungle. Kokoda is as significant as Gallipoli, for it was said the legend and spirit of the ANZACs was created in Turkey in WW1, but reaffirmed in Papua New Guinea on the Kokoda Track in WW2. This is every Australian's dream and an adventure of a lifetime. Trek Kokoda and you'll not only get to experience a destination that's inundated with military history, but a land that's vastly diverse in the world with over 850 different languages and thousands of ethnic tribes. On the trek, you'll follow in the footsteps of thousands of Australian who fought to save Australia against the invading Japanese in WW2. Over 1,600 were killed, and as twice as many were wounded during the Kokoda Campaign in 1942. You'll get the opportunity to tour battles sites from Imita Ridge to Kokoda, still riddled with war relics, fighting pits and burial sites. You'll also tour the famous Bomana War Cemetery at the start of the trek before trekking from Owers' Corner in the south to Kokoda station in the north. The walk will take you through towering and majestic tropical rainforests of the Owen Stanley Range, up great mountain ranges, down razorback ridges, through swampy flats and across raging rivers. You'll camp the night in beautiful villages and jungle campsites, inhabited by lovely Koiari and Oro Kaiva locals - descendants of the famous Fuzzy Wuzzy Angels, courageous local war carriers who helped move supplies and evacuate wounded Australians during the fighting along the Kokoda Track. Apart from the military history, it's an adventure full of unique challenges and surprises, that'll test your physical and mental strength, and pit your wits against others in adversity. After you complete the trek, you'll be full of praise, satisfaction and accomplishments for having completed one of the toughest treks in the world and an icon of Australian participation in WW2. • Walk the infamous Kokoda Track in PNG under an expert Australian Trek Leader. • Tour famous battle sites and learn about the battles of Kokoda in WW2. • Camp in beautiful villages and campsites gird by mountains and impenetrable jungle. 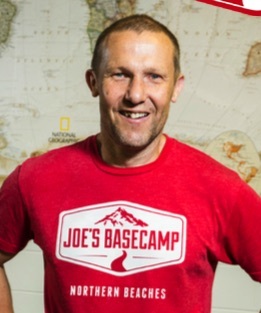 Joe is the founder of Joe's Basecamp and a passionate adventurer and wilderness enthusiast. He's been helping people tick their bucket list goals with amazing achievements for over 20 years. He specialises in unlocking the full potential of everyday people, enabling us all to reach amazing goals and conquer challenges we never thought possible. Joe's deep love for achievement, and his expertise in Strength and Conditioning, and human performance, gives him the enthusiasm, knowledge and determination to succeed. He is one of Sydney's most in-demand personal trainers, and a true leader in adventure focussed training. Mountaineering is in his blood; his father is one of the world's pre-eminent mountaineers! Joe broke his own new ground as part of the first ascent of Danga 2 (6200m) in Nepal, and has led treks to Nepal, Kilimanjaro Bhutan, and Kokoda. He will be designing the Basecamp Trek Training Program for our trek and leading you all way to Kokoda Station where this epic trek is completed. People who ordered Kokoda Basecamp Treks also ordered the free travel brochures below. Click on the images to find out more about these brochures.